Good news - two winners were chosen for the "Your Andover" contest and I was one of them. I will blog my winnings when I receive them (as requested). Thanks to everyone for spreading the word and for their support. You might have heard of a winter storm called Nemo that visited the Northeast part of the U.S. last weekend. Thankfully, we didn't lose power and I ended up having quite a bit of time on my hands to sew. I finally finished a long-standing WIP - the Krackle quilt using a layer cake from the Moda Lucy's Crab Shack collection. I am pretty happy with how it came out and have decided I will do a bigger version with stash fabrics. I just have to find the patience to cut approximately 138 ten-inch squares (which then has to be cut up into 6 triangles per square!). Cutting is my least favorite part of quilting - so it will take a while to get that done. But seriously - I wouldn't think of undertaking so much cutting if I didn't think it would be worth it. 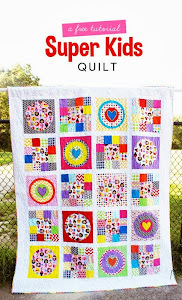 I am the kind of quilter who enjoys really simple quilts and this is the kind of pattern that looks complicated and difficult but it really isn't. The pattern is designed by Aneela Hooey and you can find it in her etsy shop here. I backed the quilt with some backing I had had in my stash for a while - it's a Momo Freebird print. I had done a lot of basic stippling lately, so I decided to mix it up a little and do some swirls and double loops. I will never be a politician, but I feel like I have been on a campaign this past week. This whole "Your Andover" contest is fueled by popularity. When notified of making it to the finals, I was told to get my "friends and family" to vote for me - most of whom don't even know what Pinterest is or even have an account. That is why I haven't shutup about it on this blog and I am calling in lots of favors with quilters and bloggers alike. I kind of hate the whole process but I am playing the game. 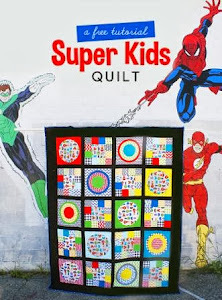 So, if you haven't already, please vote for my quilt here (you can "like" it once and "repin" as often as you want) and if you really want to do me a huge favor - please mention it on FB, Twitter, your blog, etc. So many of you already have gotten the word out and I truly appreciate it. This torture, win or lose, will be finally over tomorrow - 11 AM EST. I received exciting news a few weeks ago when I won the weekly "Your Andover" contest after I had submitted a picture of the Lizzy House rainbow quilt I made a month or so ago. The prize included a package of 6 charm packs (Lucky Penny, Constellations, and Asbury), a shopping bag, and 8 Savanna Bop FQ's. It totally made my week! Today I received the very exciting news that I am now a finalist in the competition! The grand prize is a $500 gift certificate towards Andover fabrics and a 135 FQ bundle of their Dimples collection. This totally made my day - especially because it's been a rough one filled with caring for a sick baby who caught a really nasty bug. Anyway - I could daydream for hours on what I would make with all those yummy Andover fabrics - I mean - I have a little boy who still wears his Buzz Lightyear costume everyday (only when at home of course) and I know it would be so fun to make something fun for him out of the lunar fabrics from Lizzy House's Constellations line! Anyway - I would really love it if you would take a minute and vote for me by liking and repinning my photo at this link on pinterest. The photo with the most likes and re-pins wins! Please, if you feel so inclined, spread the word. I'll be back soon with a finished project - I can't show it's progress just yet because it's a surprise for a blog reader/friend.